The first annual Midsummer Kirby Hook In was FANTASTIC. What fun we all had. 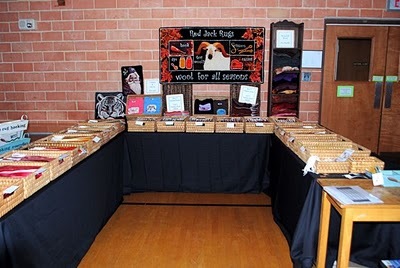 Here are some highlights including pictures of my booth. Alexander was a BIG help setting up. 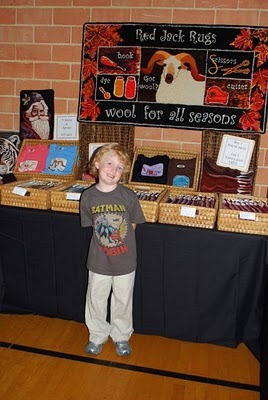 Here he is showing off the booth after helping to carry in the baskets and put the table covers on the tables. The rug sign worked out great. It was light weight enough that I just propped it up on some baskets. The DYEING TO HOOK aprons were really popular, and the t-shirts (especially the I LOVE HOOKING coral pink). It was really satisfying to me to see all my wool laid out like a color wheel around the U-shaped tables. I haven't checked to see yet what were the most popular colors out of the 70. I don't recall selling any more of one color than the rest. So my gut says that when given the choice people pick the colors that they like, and we all like something a little bit different. Here is a picture of the hook in itself. The rug show had great rugs, but since I didn't seek permission to post pictures of them (I was too busy! ), I am not putting those up. Martha Lowry won the Viewer's Choice for the Celestial Challenge rug (her own cute design of a Texas moon with a steer jumping over it). Kathy Stephens won the Viewer's Choice for her primitive rug of a boat with animals in it (...I apologize for not knowing the name of the rug). CONGRATULATIONS! 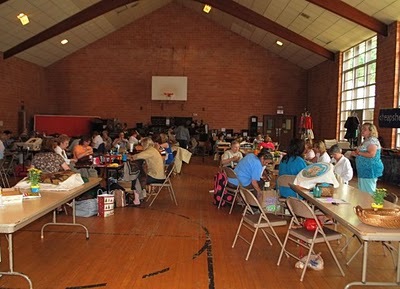 A HUGE thanks to Lurie McAdow, the women of the Kirby Hooking Circle and the staff at Bethany Christian Church. You made this 'idea' a REALITY!